THERE are just two Westerners among 40 or so locals on the ferry, in truth just an open barge, crossing the river from Hoi An's bustling Old Quarter to Cam Kim, a rural commune where village life still dominates here on Vietnam's South Central Coast. Those Westerners are my travel-writing colleague, John Rozentals and his partner Sandra, who are heading with their tour guide to the home of the guide's father-in-law. 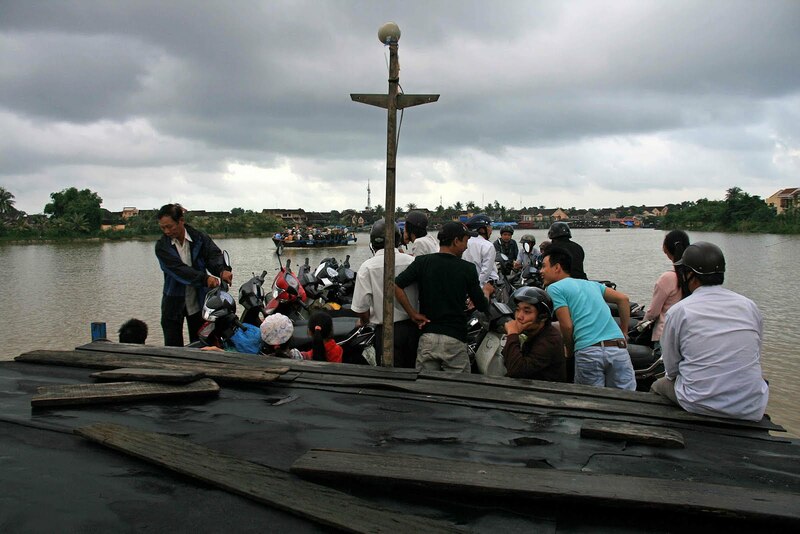 John takes up the story: Most of the locals are returning home from work, with just about all having a motorbike or a cycle they somehow jam onto the ferry with them. The chat to us seems pretty ordinary, but an elderly woman remonstrates vociferously with a public-service type about the evils of government corruption. 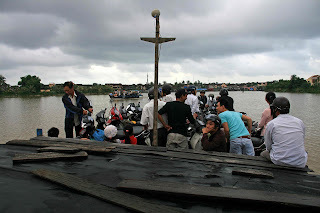 Her candidness is potentially dangerous, our guide tells us, for despite new-found economic freedom, Vietnam is still a totalitarian country, and even small commuter ferries can have ears. We cycle among market gardens, past recently harvested paddy fields with water buffalo grazing on the stubble, until we reach the father-in-law's home. His face was badly disfigured when he stumbled on a landmine while harvesting the family's sweet potatoes during what the Vietnamese call "the American War." Yet he's quite happy to sit with us on his veranda, sharing a pot of tea and memories. Perhaps it's a Buddhist thing, but the Vietnamese seem much more forgiving than we towards past enemies. It's a moving and intimate chat, a bonus reward for booking an independent tour with a personal guide and driver, and which we'd done in Australia through Footsteps in Style, a recent upscale off-shoot of budget travel operator Footsteps in Asia. They provide airport pick-up and drop-off, organise accommodation and guided activities, and probably best of all, pre-tailored itineraries can generally be changed on the spot if something more appealing crops up. We go just up the road to Kim Bong, a village whose craftsmen helped fashion many of the magnificent historic buildings in the nearby ancient capital of Hue, and which is re-emerging as a significant woodworking centre. 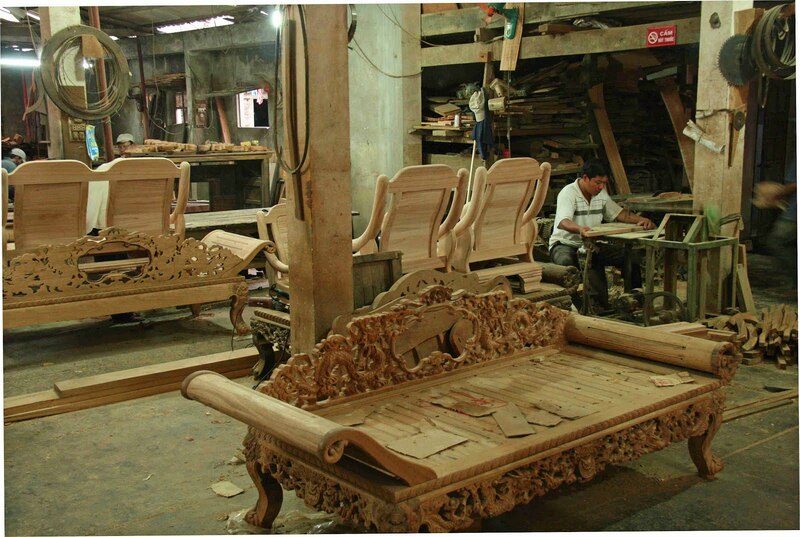 Huynh Ri, a 15th-generation master craftsman, has used his studio to train hundreds of artisans, whose projects have included the restoration and maintenance of Hoi An's Old Quarter, a UNESCO World Heritage site that reflects the port's status as a major trading centre from the 16th to 18th centuries. The Old Quarter is compact and best covered on foot. You could easily spend several days here exploring the narrow streets and alleys and discovering fine old structures — the Japanese Covered Bridge, which dates from 1593 and incorporates a Vietnamese temple; the Cantonese Assembly Hall, with its many fine Chinese artworks; the Museum of Trading Ceramics; the extravagant Phuc Kien Assembly Hall with its elaborate facade and temple to Thien Hau, goddess of the sea and protector of sailors. There are also several family homes and chapels open for inspection. 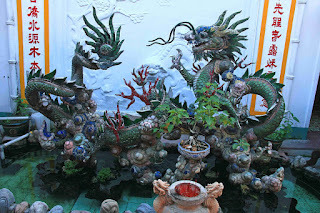 My favourite was the House of Quan Thang, a single-storey shop-house built by a Chinese trader in the 1700s and still occupied by fourth generation ancestors. 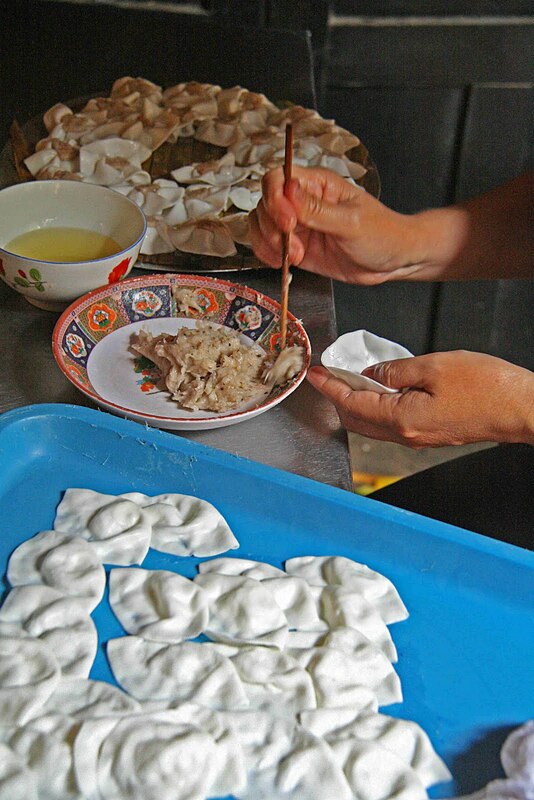 The current great-grandmother must be well into her 90s yet wanders around as spritely as ever, sharing jokes with other family members, many of them sitting at the large kitchen table making banh bao vac, a local specialty shrimp dumpling also known as white rose. The 30-kilometre stretch of road to here from Da Nang Airport includes China Beach — named by American soldiers on R&R — and offers plenty of resort-style tourist accommodation. 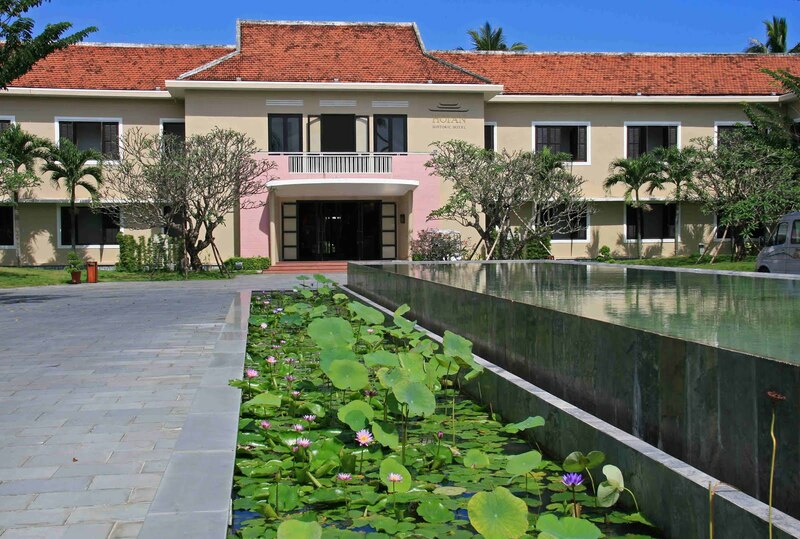 But our interest in culture rather than beach culture drew us to the Hoi An Historic Hotel which in a previous life served as headquarters for French, American and Vietnamese administrators. This charming, rambling property is literally a couple of minutes from the Old Quarter, has a reasonable restaurant and offers most of the creature comforts, though as in many older Vietnamese hotels, the plumbing can be a bit temperamental. 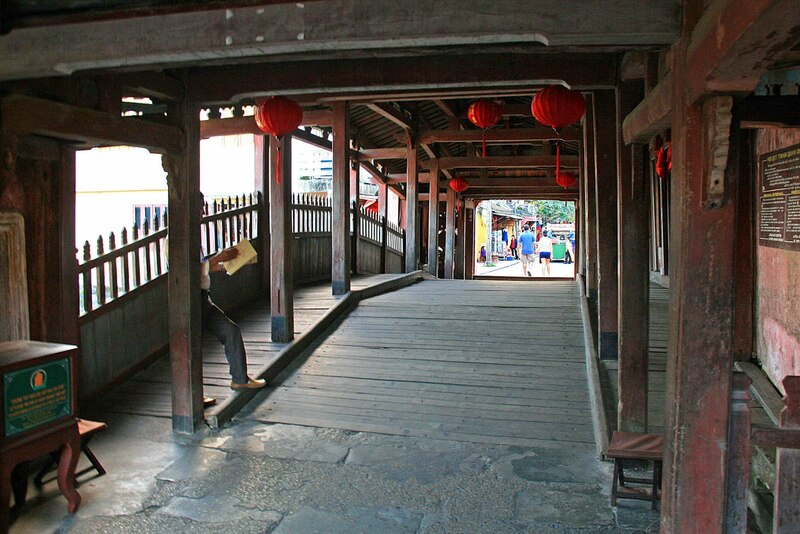 Hoi An's waterfront contains a plethora of dining opportunities at ridiculously cheap prices by Australian standards. Spend up, and you'll quickly appreciate the rewards of parting with those extra few dollars. SHARING the ferry home with everyone's motorbikes. 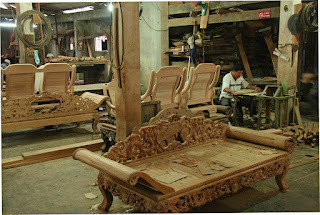 CRAFTING furniture at Huynh Ri's workshop in the woodworking village of Kim Bong. 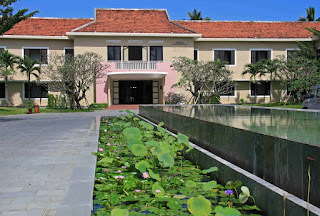 THE Hoi An Historic Hotel, literally a couple of minutes from the Old Quarter. WHITE rose: a local specialty being made in the House of Quan Thang.